David Deininger of Monroe and Kriss Marion of Blanchardville were elected to the State Governing Board of Common Cause in Wisconsin (CC/WI) at the organization’s April 11th board meeting in Madison. The election results were announced by CC/WI Board Chair Tim Cullen of Janesville. 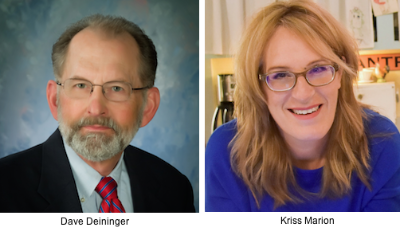 “Common Cause in Wisconsin is fortunate to have two community leaders as skilled and as dedicated to honest, open, fair, and accountable government and politics as Dave Deninger and Kriss Marion,” said Cullen. “Their election to our board continues our long tradition of bringing together citizens of both major political parties who seek bipartisan solutions to the urgent need to bring about fundamental political reform in Wisconsin,” Cullen added. Deininger, of Monroe, served as a Republican State Representative from 1987 to 1994, when he was elected as a Circuit Court Judge of Green County. In 1996, he became a judge on the Court of Appeals of Wisconsin, District IV and retired in 2007. He then served as a member and Chair (2007-2008) of the non-partisan Government Accountability Board, which oversaw and administered Wisconsin’s elections, public officials’ ethics code, and campaign finance regulations. He served again on the G.A.B. from 2010 to 2013 and was Chair in 2012. “I am increasingly concerned about the direction that state government and politics has taken in recent years and I want to assist Common Cause in Wisconsin in its efforts to return Wisconsin to its once nationally-recognized status as a beacon for clean politics and good government,” Deininger said. “Fair voting maps and fair elections are not partisan issues and we need to begin to work again in a bipartisan manner to restore citizen confidence in our democratic institutions,” he added. Marion, of Blanchardville, is a small business owner and organic farmer. She is a Lafayette County Supervisor and serves on the Lafayette County Development Corporation. Marion ran as a Democrat for the Wisconsin State Senate in the 17th Senate District in 2018 in a contest that saw record campaign spending. She received the endorsement of the Wisconsin State Journal, in part, because of her support for ending partisan gerrymandering in Wisconsin. Marion had not been previously involved in partisan politics and has a long record of community involvement in rural issues, most prominently for clean water. “With dark money flooding into local campaigns and gerrymandered maps that keep legislative seats from being competitive, the electorate is robbed of an opportunity of being able to get to know the truth about their candidates or to be able to select a challenger who has any chance of defeating an incumbent,” Marion said. “That should be a red flag for citizens that the current system is broken. Educating citizens and fighting for fair elections is what Common Cause in Wisconsin is all about, and I am delighted to be part of their effort and to direct my energy toward these important objectives,” Marion concluded. Common Cause in Wisconsin is the state’s largest non-partisan political reform advocacy group with more than 7,500 members and activists. For more information, go to commoncausewisconsin.org or call 608-256-2686.